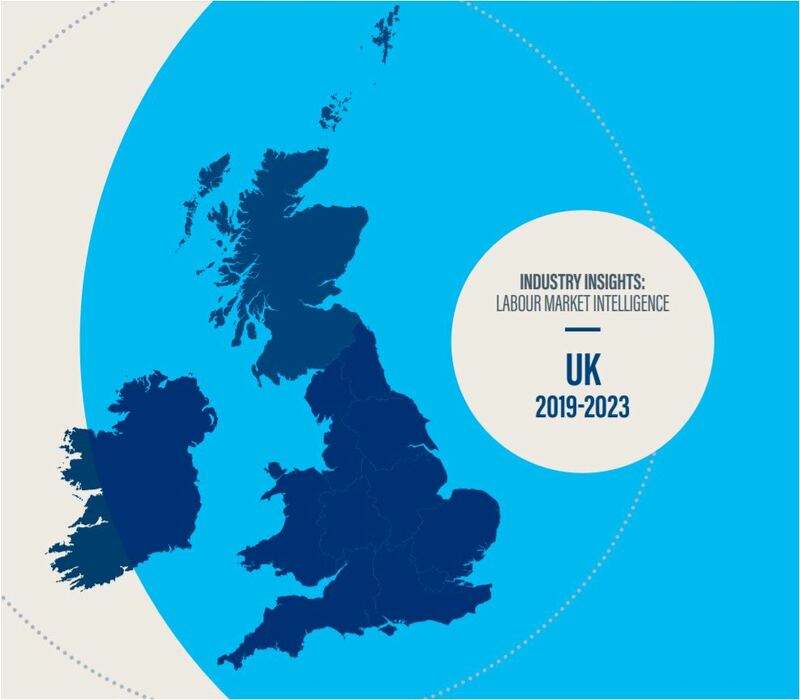 Doka UK 12 April, 2019.-In our next two blog articles, we highlight reports published by the Construction Industry Training Board (CITB) and Experian research on the demand and forecast for construction professions over the next few years. In this first edition, we focus on these leading construction projects by geographical areas. The most buoyant of the English regions are projected to be the West Midlands and South West. Infrastructure output is likely to remain the key driving force for expansion in the South West, largely owing to work on Hinkley Point C nuclear power plant. Two years after construction began, Hinkley Point is on track to become fully operational in 2025. An anticipated 10.6% annual average rise in infrastructure output is likely to be the single largest driver of overall expansion in the West Midlands, supported by increased work on the HS2 scheme, preparations for the Commonwealth Games and a range of improvements to the M6 motorway. Greater London is projected to see decent growth averaging 2.1% over 2019-23, driven by infrastructure work on HS2 and the Thames Tideway, and strong housing growth, despite the current weakness of house prices in the region. Demographic pressures remain strong in the capital, but growth may be strongest in the rental sector – both social and private – given that house prices in London continue to be unaffordable to many. The Mayor of London recently pledged £288m to four housing associations to help build an extra 4,705 affordable homes across the capital by March 2022. This is to help meet his target of 116,000 new affordable homes in the next four years. 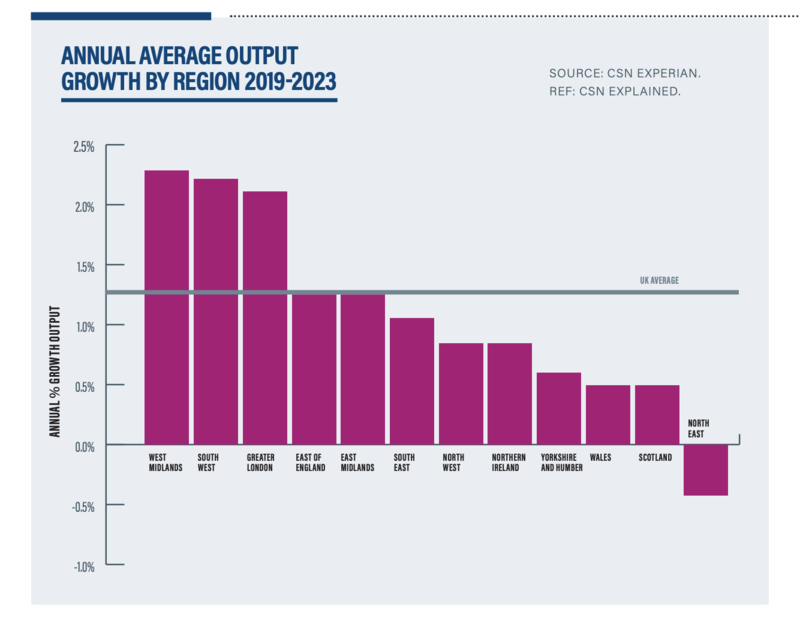 The East Midlands is forecast to have an annual average growth rate of 1.2% for construction output from 2019-2023, slightly lower than the UK average growth rate of 1.3%. Public sector housing (3.8%) and Commercial (2.6%) work are set to slow in the region over the next five years. 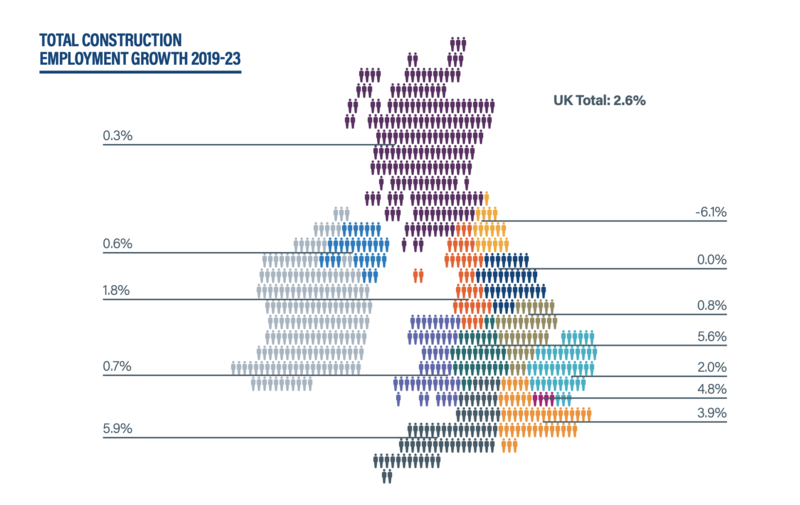 Construction employment in the region is forecast to grow at an average rate of 0.2% per year, rising from just under 173,000 workers at the end of 2018 to over 174,000 by 2023. Growth is expected to be strongest for professional occupations such as civil engineers and surveyors. The forecast is for construction output growth in the South East to grow at an average annual rate of 1.1% from 2019 to 2023, slightly lower than the UK growth rate. Growth in the region will be mainly driven by private housing (3.5%) with public housing (1.9%) also set to increase. 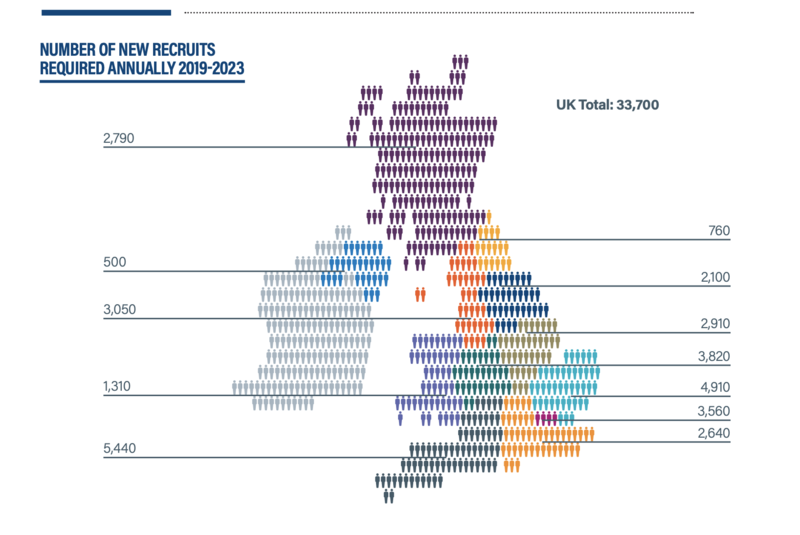 With output growing, the construction workforce in the South East is also set for an average annual increase of 0.8%. This means that the workforce of over 413,000 at the end of 2018 is set to increase to nearly 429,500 by the end of 2023. This growth is spread across a range of managerial, professional, technical and skilled trade occupations. There is little doubt that the ongoing lack of a government in Stormont is impacting both the economy and construction in Northern Ireland, directly through stasis in the signing-off of public projects, and indirectly through loss of confidence in the private sector. However, strong underlying demand for social housing is likely to drive expansion in the sector there are a number of large long-term housing developments in Northern Ireland. This should help drive steady output streams in the private housing sector. The North West, which was reported to be one of the strongest regions for the 2018-22 period, has gone down the rankings with growth averaging 0.8% a year for 2019-23. This is largely to the loss of the Moorside new nuclear build project. Construction output in Yorkshire and Humber is forecast to grow at an average annual rate of 0.6% from 2019 to 2023, which is less than half of the UK growth rate. Work in the infrastructure (2.2%) and public-housing sectors (2.5%) are the most prominent drivers of growth, along with private housing (0.9%). 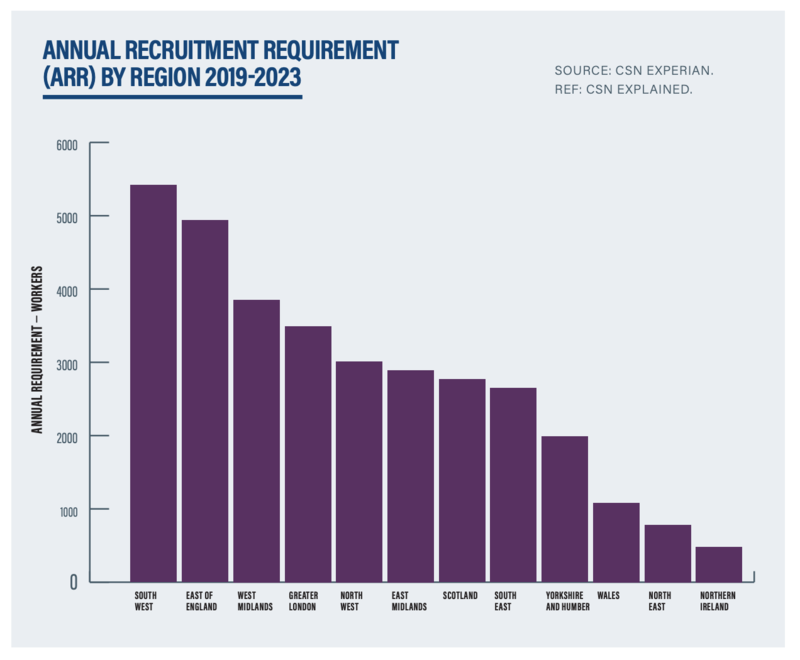 The low level of output growth in the region means that construction employment is forecast to remain steady at around 200,000 workers between 2019 and 2023. Like other regions, Yorkshire and Humber is expected to see slightly more demand for managerial, professional and technical occupations. Wales, which has led the growth rankings for a number of years, has seen a significant reduction in growth due to the recent announcement, from Hitachi, that the Wylfa nuclear new build project has been put on hold. Annual average output growth is projected to average only 0.5% a year without this project, leading to marginal employment growth of 0.1% a year. However, there are some significant transport projects in the pipeline, led by the £1.4bn M4 upgrade around Newport, which, it is hoped, will now start this year. Also in the 2019 pipeline in is the final section of the A465 Heads of the Valley upgrade, worth £500m, and the South Wales Metro at £440m. Construction output in Scotland is expected to grow by an annual average of 0.5% from 2019-23, leading to marginal employment growth over the period. Infrastructure output is projected to fall sharply for one more year in 2019 from its very high peak in 2015, but then begin to stabilise as work increases on projects such as the dualling of the A9 between Perth and Inverness, and the £1.3bn electricity interconnector between Scotland and Norway, scheduled to start in 2020. Scotland is also likely to see good growth in public housing and housing repair and maintenance, which will compensate for falls in the non-housing building sectors. The North East is the only region predicted to see a decline between 2019 and 2023, although the drop takes place in the first year of the forecast period. Expansion returns thereafter, but less housing pressure and lack of large infrastructure projects means that year-on-year growth is modest. In our next blog article, we look further into this report produced by the CITB and Experian research with analyses around the most dominant construction sectors over the coming years.